Telemedicine is quickly becoming a pillar of modern healthcare, and providers are using this technology to improve clinical outcomes and streamline workflows. Unfortunately, there can be a challenging amount of information to navigate as you balance financial and logistical concerns. 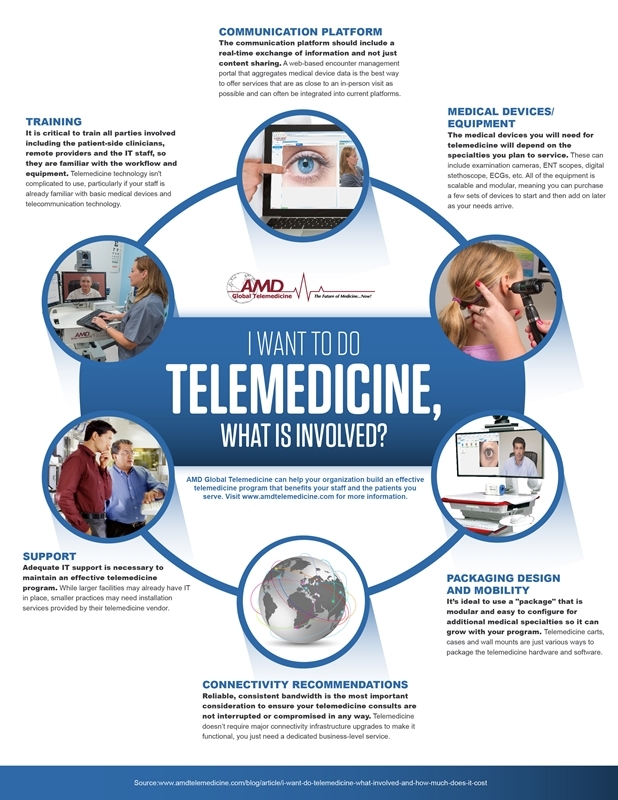 Here's what you need to know when considering equipment for your telemedicine program. Telemedicine connects patients and providers over many miles like never before, and requires an intuitive interface and a secure system. Look for a partner with a proven, interoperable platform and an open systems architecture. In this way, your telemedicine visits can be easily integrated into your EHR/EMR for improved collaborative care. "Video-conferencing software can cost as little as $1,500 per patient site." Opt for a web-based encounter management portal that compiles medical data and offers real-time collaboration, instead of just content sharing or store and forward technology. Video-conferencing software can cost as little as $1,500 per patient site without any added cost for the remote provider. A hardware-based system, meanwhile, can be considerably more expensive. The most modern telemedicine systems are sleek and efficient, and don't require expensive additional hardware. Adoption is simple and the technology allows you to easily communicate with colleagues as well as remote patients. The best telemedicine systems are able to seamlessly pair with the latest medical devices, including ENT scopes and ECG readers. When working with a telemedicine vendor, you have quite a few options to select the best solution for your practice. You might opt for a smaller package with one or two medical devices and then add additional equipment later on as the needs arise. The cost of a basic primary care service package ranges from $5,000-$10,000. These offerings usually include devices such as an examination camera, ENT scope and digital stethoscopes. Providers find telemedicine to be a successful investment in large part because it promotes efficiency. The latest technology is portable and easy-to-use, and the best vendors offer customizable packages. Carts, cases, wall mounts and other telemedicine systems can be selected based on your organization's specific needs.. This way you can tailor it to the environment it will be used in. The flexibility makes it possible to successfully address your targeted goals and promotes a smoother implementation. All-in-one telemedicine systems include software, primary care medical devices and the mobile carts or cases. These turnkey solutions are especially useful for providers offering a wide range of services. These packages can range from $20,000 to around $28,000. You need not upend existing technology or communication solutions to benefit from telemedicine adoption. So long as your facilities have a strong, reliable internet connection, you can leverage telemedicine to improve communication and expand your organization's reach. From there, you can use a telemedicine platform alongside other internal systems without delay or disruption. Adopting new technology or software comes with a learning period, and this can give some providers pause. Fortunately, clinical telemedicine equipment training is straightforward and intuitive with the right system. This is especially true if staff has existing familiarity with basic medical devices and modern communication technology. There are two types of training programs, both of which ensure long-term success for your clinical telemedicine platform: user training for clinicians and nurses, and technical training and installation for the IT staff. Training programs like these can range from $200 to $2,000 per site. This estimate depends on the package selected, the number of users and a few other factors. Your vendor will walk you through this process, and organizations such as the American Telemedicine Association offer additional resources online. Talk with your telemedicine vendor about support options that can work with or stand in for an IT department. Navigating the waters of telemedicine can be much easier with industry experts working alongside you and your staff, and the best vendors work with you to build expertise and familiarity during implementation and beyond.